Practice Linux questions and answers for interviews, campus placements, online tests, aptitude tests, quizzes and competitive exams. Here is a listing of Linux / Unix Technical Interview Questions & Answers for experienced IT professionals as well as fresh engineering graduates. These questions can be attempted by anyone focusing on Linux Development and Systems programming. 1. Given a code snippet below? 3. What is stored in logfile as per below mentioned code if we execute ./a.out > logfile? What is the logfile size now if it’s initially was 1024 bytes? 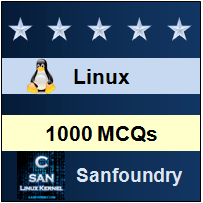 Sanfoundry Global Education & Learning Series – Linux Administration & Programming. Learn detailed answer of these interview questions and an in-depth coverage on Linux Systems Programming by our popular training program titled Linux Systems Programming delivered by our Founder & CTO. Read here to know more about the skills required to become a Linux Systems Developer. Here’s the list of Best Reference Books in Linux Commands & Shell Programming. Here’s the list of Best Reference Books in Linux Kernel, Device-Drivers & System Programming. To practice all questions on Linux Administration & Programming, here is complete set of 1000+ Multiple Choice Questions and Answers on Linux. These questions focuses on Process Management, Memory Management, File Management, Inter Process Communications, Signal Handling, etc.